Felix Dahn was a nineteenth century German Professor of Jurisprudence, as well as a historian, novelist and poet, who was greatly admired by his academic contemporaries for his grasp of the historical detail of the periods about which he wrote. He has been well served by this magisterial translation, which at last makes this astonishingly rich novel available to the modern English reader. This is a story - perhaps the story - of the clash between two great civilizations of the sixth century of the Common Era, when the Roman Empire had crumbled into dust; the struggle for Rome, and for Italy, between the Eastern Roman Empire of Byzantium, ruled by Justinian, and the Gothic warrior tribes who had captured Italy under their legendary king Theodoric. We see this epoch through the eyes of different personalities at the centre of these events which shook the world as they knew it; most are historical figures and some are imaginary but typical; Justinian and his beautiful and scheming wife, Theodora; the great commander Belisarius, immortalised by Robert Graves; Totila and Teias, two Gothic kings, one as bold and bright as the sun and the other as black as night; and Cethegus, the Prefect of Rome and the last of the Romans, whose cold and calculating nature runs through the book like a steel thread, who will stop at nothing to regain the ancient city, and who, in the end, fails and redeems his many crimes with a hero's death. 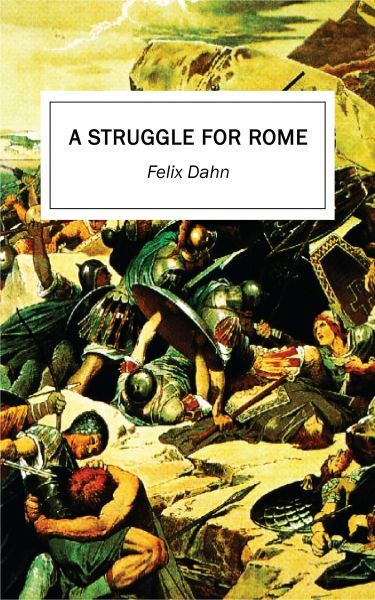 Firmly based on historical fact and contemporary sources, A Struggle for Rome is one of the great historical novels of the world. Dahn's writings were influential in the conception of the European Migration Period (Völkerwanderung ) in German historiography of the late 19th and early 20th centuries. His multi-volume Prehistory of the Germanic and Roman Peoples, a chronology of the Migration Period that first appeared in print in 1883, was so definitive that abbreviated versions were reprinted until the late 1970s. U. H. Wilken Texas Wolf #33: Stoppt Delgaditos Terror!